I consider myself lucky to have had three grandmothers. At the age of 24 I was gifted a new grandmother, Dr Mary O’Meara Pepper. I received things from my bonus grandmother that I’m only now making sense of, more than three decades later. Like, unconditional love and a sense of belonging. She also helped me reconnect with music making. My parents, Sue and Ralph Bulmer, divorced in 1980. In 1983 my mother acquired a new partner, Terry O’Meara. Terry was an old friend from my mother’s high school days in Southern California. In 1984 he moved from California to New Zealand, to be with my mother. Within a few months of Terry’s arrival, his mother, Dr Mary O’Meara Pepper, turned up to visit. I think New Zealand must have been on her bucket list. The first time I met Dr Mary she did a “woo-woo” healing on me. It was a family barbecue in Auckland. I was sitting on the couch groaning because I had a sore ankle. Dr Mary asked me if I’d like her to take the pain away. After gaining my permission, she drew the pain out completely with a hand movement energy modality she called “smoothing”. The pain returned after about 12 hours, but I will always remember the feeling of astonishment, that pain could just disappear like that. This was the 1980s. I knew about alternative healing, but I’d never experienced it. My parents were lefty scientists. Dr Mary was very spiritual, but she wasn’t ethereal or mystical. She was very practical and grounded, rigorous, strong-minded. When I met her she was in her early 80s, about the same age as my grandmothers would have been. But she wasn’t old and frail and slow. She was tall, strong, vigorous. When she wasn’t visiting my mother and Terry, she hopped on a bus and travelled around the South Island. She told me she rather enjoyed the New Zealand pies – she’d never had anything like that in the USA. This story is about Dr Mary. However, I’m going to acknowledge my other grandmothers too, because they were important in my life. But they both passed away in 1983. I didn’t get to spend much time with either of them as a young adult. Dorothy Hermon Hughes (Bulmer) was my father’s mother, my Granny Bulmer. Here’s a post about my father, Ralph Bulmer, which includes a bit about Dorothy. 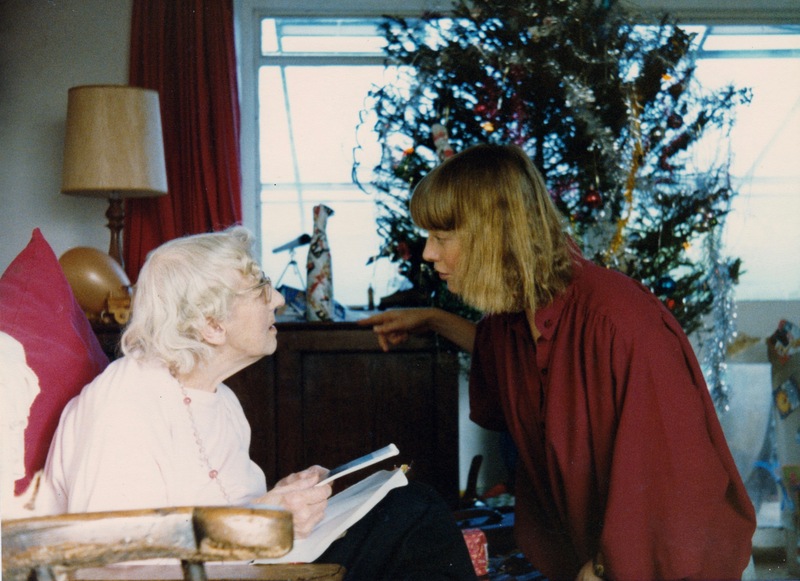 I spent time with Granny during one memorable, snowy trip to Gloucestershire at Christmas in 1980. She was in her early 80s, frail but delighted to see me. She was full of family stories, which I lapped up. One day I’ll write more about her. My Granny, Dorothy Bulmer, telling me some outrageous piece of lore about our illustrious ancestors. Adeline Nordendahl Hirsh was my Mormor – Swedish for mother’s mother. I’ve written about Adeline here. I saw Mormor more frequently, because she came several times to stay with us in Auckland in the mid 1970s. I think this must have been very brave of her. She had trouble understanding New Zealand accents. 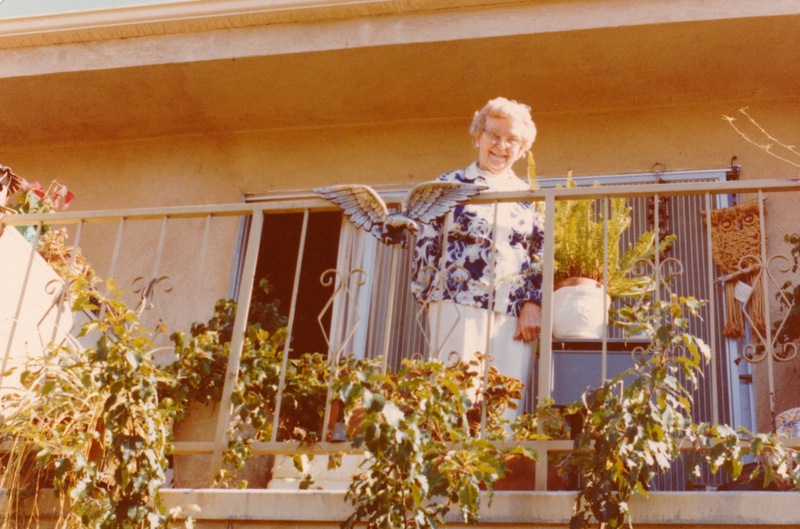 My Mormor, Adeline Hirsh, at her Pasadena apartment in about 1980. Dr Mary’s sons, Terry O’Meara and his brother Brian, were both important men in my mother’s life. She told me that Brian had been her first love, but she thought that Dr Mary didn’t approve of her. Terry was my mother’s second husband. They were married in 1985 and their marriage lasted until his death in 2010. This story has two sets of siblings: the O’Meara brothers, Terry and his younger brother Brian, and the Hirsh sisters, my mother Susan and her older sister Mary. There are several Marys in this story. Also lots of doctors. This isn’t the full story of Grandma Mary’s family. (I soon started calling her Grandma, with her permission.) I don’t want to tell family stories that don’t belong to me. I’m just telling the pieces that I am part of. Terry and Brian had been high school sweethearts of my mother and her older sister Mary in Pasadena, California, in the 1940s. The two pairs of siblings were of similar ages and they got on well. They used to double date. Terry and Brian’s parents, Lawrence and Mary O’Meara, were both doctors. Dr Mary had a local paediatric practice. However, any budding romance was cut short when Lawrence and Mary divorced. 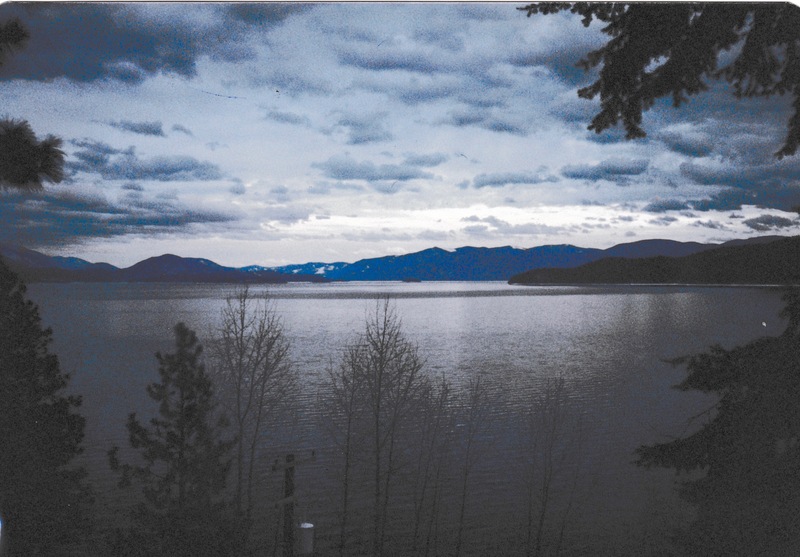 Lake Pend Oreille in February. The view from Grandma Mary’s house. However, they kept in touch, and the Hirshes visited the O’Mearas during one memorable summer. Sue told me stories of sitting in a cherry tree with Brian, stuffing herself full of cherries. I remember her showing me a photo of Brian in her old photo album. Sue’s sister, Mary Hirsh MacMichael, stayed in contact with Terry and invited him to Adeline’s memorial in 1983. That’s where Sue and Terry connected. Brian died in his forties from a heart condition. I think my Aunt Mary (who was also a doctor) may have been pretty annoyed that my mother married her ex-boyfriend. Terry was good friends with both Mary and her husband Ross, and used to stay with them in South Pasadena every year when he visited his family in the USA. The last photo I have of Grandma Mary, aged 98. 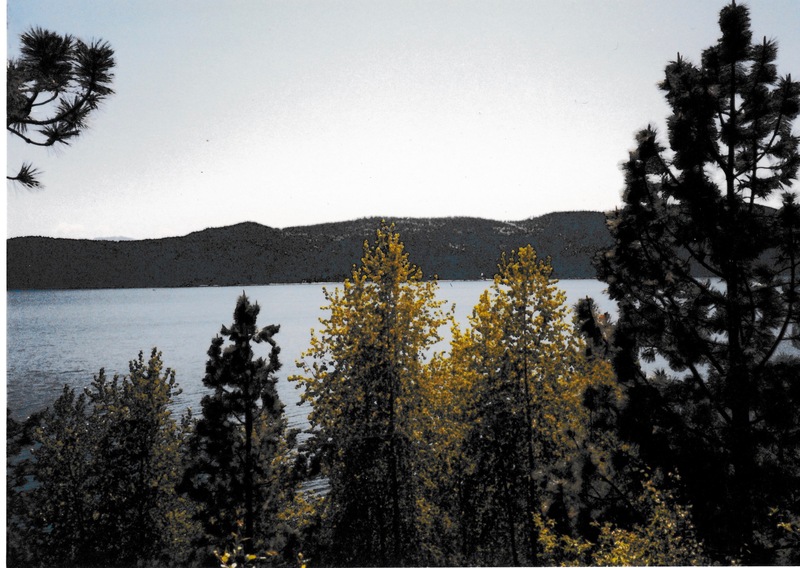 When I first met Dr Mary, straight after she cured my ankle pain, she invited me to come visit her at her home near Sandpoint, Idaho. It’s a small town on Lake Pend Oreille, up near the Canadian border. The railway line that goes across the Northern USA goes through Sandpoint. In April 1985 I arrived in Sandpoint on a train in the middle of the night. I was literally speechless, having developed laryngitis while visiting my Bulmer cousins in Vancouver, BC. Grandma Mary nursed me back to health. 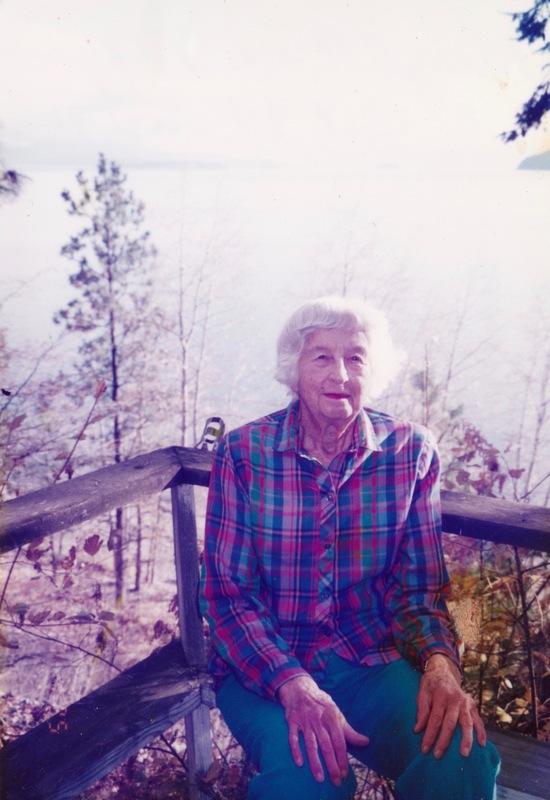 I spent several weeks staying with her, in her mobile home perched on a hillside overlooking Lake Pend Oreille. Mary’s daughter-in-law Elisabeth and Elisabeth’s second husband Wayne Martin (who was also a nephew of Mary’s) lived further up the hill. Elisabeth and Brian’s daughter, Mary, known in the family as “Young Mary”, lived a few miles along the lakeside. As well as a grandmother, I’d acquired some new family, and everyone made me welcome. Grandma Mary was an elder in the local Quaker group. She had friends of all kinds. Some were her age, some were my age, and everything in between. Some were eking out a living in off-grid log cabins; some were wealthy people who had seasonal homes in Northern Idaho. I also remember meeting an architect who built underground homes. In her 70s, after her second husband, Claude Pepper, died, Mary had provided medical services in remote Navajo reservations. 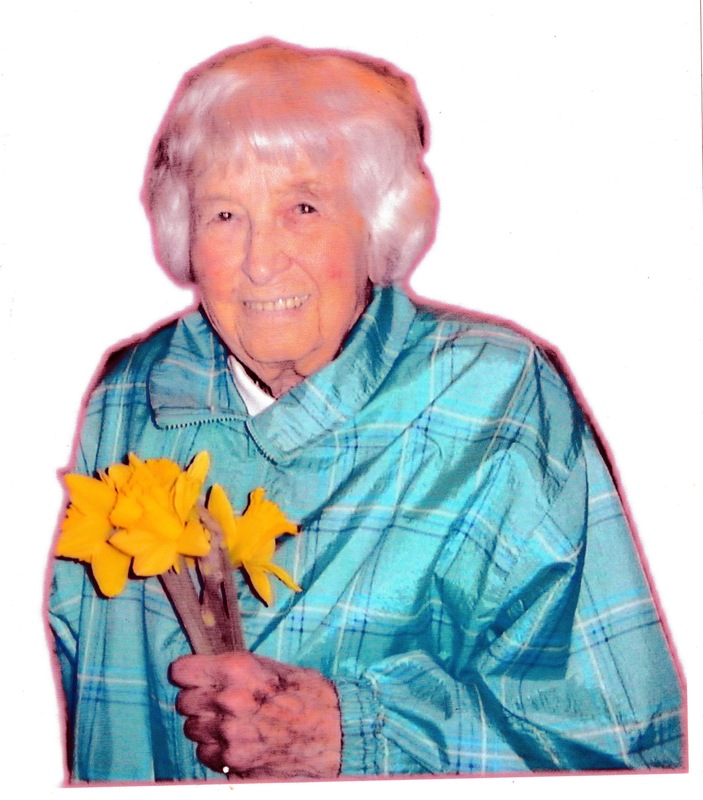 Throughout her 80s and 90s she was active in her local community, regularly visiting the residents of local retirement homes – many of whom would have been substantially younger than her. A few years before her trip to New Zealand, Grandma Mary had travelled through Micronesia. She would arrive on an island, introduce herself at the local hospital, and ask if there was anything she could do to help. They could always use another doctor. When Mary felt that her purpose for being in a place had been fulfilled, she would move on to another island. Dr Mary OMeara Pepper with (at left) her daughter-in-law Elisabeth O’Meara, and at right her granddaughter Mary O’Meara Malloy. I received from Grandma Mary unconditional love, kindness, healing and friendship. And wonderful, delicious, seasonal food, including wild venison, pecans and foraged forest mushrooms. Grandma Mary always seemed so vigorous to me, even though she was in her 80s. But one day I heard her calling from the bathroom. She was asking me to help her to get out of the bathtub. “I just don’t have much upper body strength,” she said. I realised that she had survived breast cancer. She had undergone a double mastectomy in her 60s. Mary showed me how to do the pain removal “smoothing” technique. She said it wasn’t a magic skill – anyone could learn to do it. I accompanied her on home visits with people who were dying from cancer, and watched while she relieved them of pain through “smoothing”. I’ve never found anyone else who knows about “smoothing”. It’s a healing modality, but not hands-on. You don’t touch the person, you just move your hands a few inches away from their body. So it’s not strictly therapeutic touch. It’s not necessarily spiritual – there’s no particular invoking or spiritual understanding involved (unlike reiki, for example). I’ve used it a few times, but not for many years. It takes a lot of chutzpah to get people to let you do this kind of healing when you’re not a professional healer. Mary grew up in Newport Beach, California, where she was raised by her Quaker grandparents. Her mother had died when she was two. Her father was a fisherman. I think Mary must have been stupendously bright, to get to medical school in the 1920s. She trained as a doctor and osteopath (the training included both disciplines) at the University of California. It was the prohibition era. Mary described the high-jinks of driving around with other students, with a still in the car boot, making alcohol. At medical school Mary met and married Lawrence O’Meara, who was also a doctor, and they had two sons, Terry and Brian. Brian stayed in Northern Idaho and married Elisabeth, a beautiful Frenchwoman. They had a daughter, Young Mary. Brian passed away in his 40s from a heart condition. Young Mary said to me that they thought it was related to a workplace accident with electrocution. He was an electrician. Terry followed his parents to train as a doctor and osteopath at UCLA, got married and had three children: Michael, Kelly and Shawna. He became a psychiatrist and worked in the California state mental health system for many years. Terry’s middle child, Kelly, died of cancer aged seven, and his wife died in the late 1970s. Meanwhile my mother, Sue, had gone off to New Zealand in the mid-1950s and met and married my father, Ralph Bulmer. Here’s a link to a post about Sue’s colourful life. Sue’s older sister Mary also became a doctor. 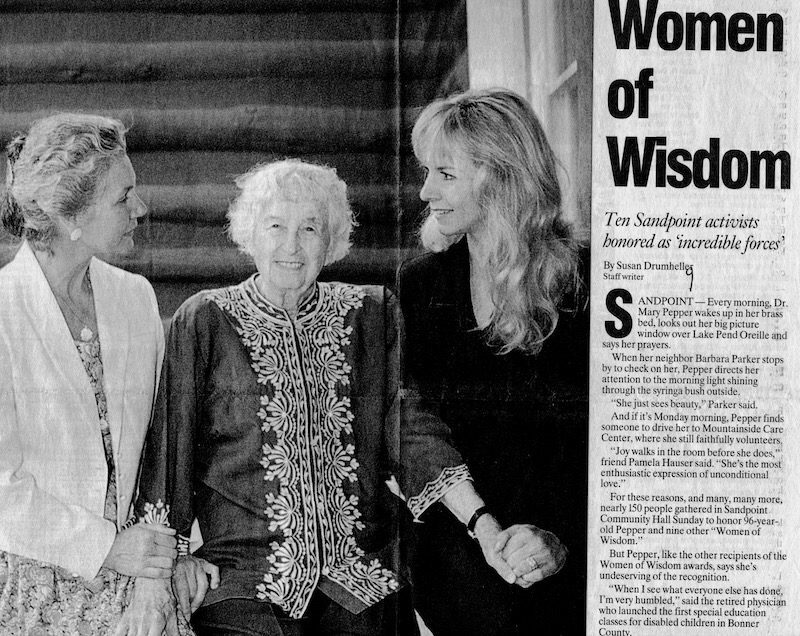 She went to Stanford Medical School, where she had to apply three times to get accepted because they only took a few women per year in the 1950s. Mary was one of the first women doctors to train in the new specialty of radiology. When Terry reconnected with my mother, the state mental health services (including his job) were being dismantled by then-California Governor Ronald Reagan. He was ready to take early retirement and move to New Zealand. The view from Grandma Mary’s house in August. Grandma Mary’s mobile home was modest but comfortable in both winter and summer – Northern Idaho gets seasonal extremes of weather. It was small, but not exactly a tiny home. There were three bedrooms, two bathrooms, a small kitchen, a living area, and a porch with insect screens. It wasn’t fancy but it was well insulated, neutral in its aesthetics, easy-care – and in an amazing place. There were stunning lake views from the windows all along one side of the house. On the side away from the lake, built into the hillside, there was a root cellar, a cold store-room for preserved food. It was a revelation for me, to meet people who had chosen to live in such a beautiful place, in comfortable but not opulent surroundings. My intellectual parents always lived as though their physical and aesthetic surroundings were irrelevant. My parents both had their heads and hearts in other places and they were only reluctantly in Auckland, New Zealand. They didn’t celebrate the changing of the seasons and they didn’t choose to live in beautiful (or comfortable) surroundings. Northern Idaho was a bit like the South Island of New Zealand, with beautiful mountains and lakes. But with so much amazing wildlife – bears, moose, racoons, porcupines and more. My parents’ marriage had collapsed in my late teens. After our family home was sold I had no safety net, although I was always welcome to sleep on my mother’s living room floor. Also at this time I hadn’t played my violin for something like three years, after dropping out of music school and orchestras. Grandma Mary wasn’t a musician herself, but she could see that being a musician was vitally important to me. She gently but firmly steered me towards applying for a summer job at a hotel in Glacier National Park, across the state border in Montana. Many Glaciers Hotel had a tradition of hiring young musicians as seasonal staff. Hiking in Glacier National Park, Montana. Note the 80s hair. I’d left my violin behind in New Zealand, but Aunt Mary in South Pasadena very kindly agreed to lend me her old violin for the summer. I spent a happy summer working on the hotel front desk and making music in my time off. (And hiking in the mountains.) It was a turning point in my life. 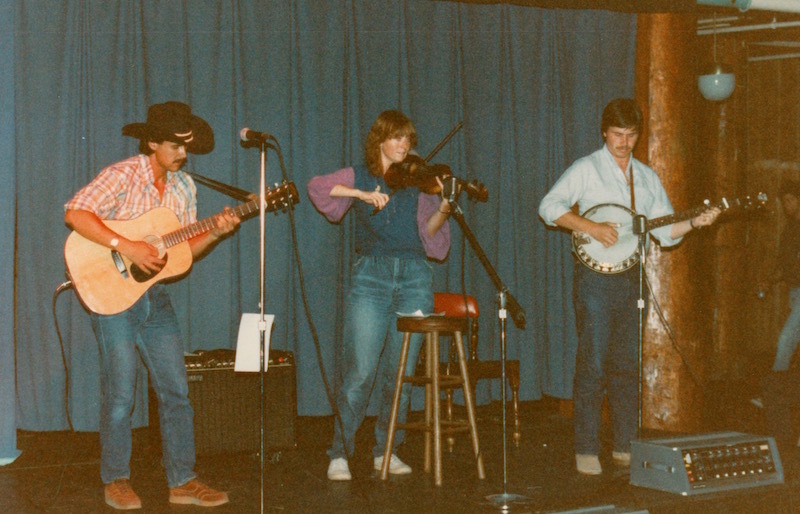 I found I could play fiddle, and improvise, and jam with other musicians. I felt at home with this kind of music making, in a way I’d never felt in orchestras. My first gig. I think the guitarist is Ed from California, and the banjo player is Lincoln from Virginia. After the summer ended I visited Grandma Mary briefly before heading south to the Grand Canyon. After that I travelled across to the east of the United States, and to the UK. 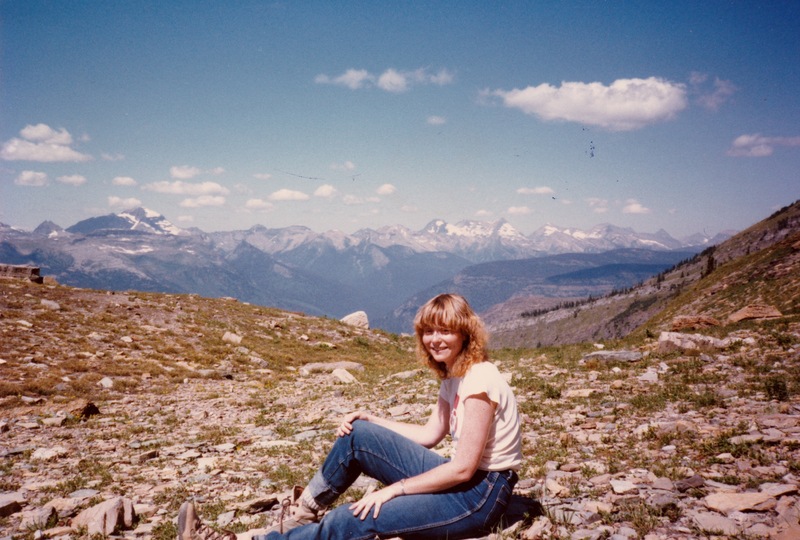 My last visit to Sandpoint was in February 1986, when I flew in from New York on my way home. The lake was frozen and so was the road in front of Grandma Mary’s home. She taught me how to drive safely on a frozen gravel road. It’s not something I’d ever learned in New Zealand. After I returned to New Zealand she kept in touch. She always sent cards and birthday presents, and Terry would bring me something from Sandpoint, when he returned from his annual visit. Grandma Mary passed away aged 98 in June 2001, after falling and breaking a hip. I only spent a few short weeks with Grandma Mary. But she had a huge impact on my life. She has always been a reference point, a touchstone for me. She made me feel that I was loved, trusted and appreciated unconditionally, at a level that was lacking in my young adult life. At the time I didn’t know what to do with this, but that didn’t matter. Grandma Mary was there for me anyway. It’s only looking back that I can see what an amazing gift it was and still is. I feel huge gratitude to her.